The power switch is a low voltage, single N-Channel MOSFET high-side power switch, optimized for self-powered and bus- powered Universal Serial Bus (USB) applications. In worse operating condition, an input voltage spike may over the chip maximum input voltage specification to damage the chip. This application note introduces solutions for reducing the input voltage spike on power switches. Figure 1 shows a typical application circuit of power switch. There are two capacitors for input (Cin) and output (Cout). Flag pin is an open drain output and one resistor (R1) is necessary for pull high resistor. The power switch delivers power from input pin to output pin when EN pin is enabled. The power switch features Enable control signal, Flag signal, over current protection, short circuit protection, and thermal shutdown protection. In steady state normal operation, the power switch delivers a certain current from input power source to output pin and the voltage at VIN pin almost equals to the input power source. However, when the power switch is turned off suddenly, it will induce a spike voltage at VIN pin. The spike voltage could be expressed as below. Where L is the parasitic inductance of input wire between power source and power switch input pin, di/dt is the change rate of input current. If the spike voltage level exceeds the chip absolute maximum rated input voltage, it may damage the chip. Figure 2 shows the test result of RT9711 power switch operated in worse condition, input voltage is set at maximum voltage 6.5V and input wire length is 35cm. When the output current is over maximum current rating, the power switch limits the output current at OCP level (~2A in this case) and decreases the output voltage so that the chip temperature raises up. Once the chip temperature reach a certain over temperature protection (OTP) level, the chip will turn off the power switch. So, the change of current in wire will induce a spike voltage (Vin_spike) at the input pin. The test result shows that the maximum voltage is 8.8V and it is over the absolute maximum rating of the chip (6.5V). The chip may be damaged by the spike voltage. 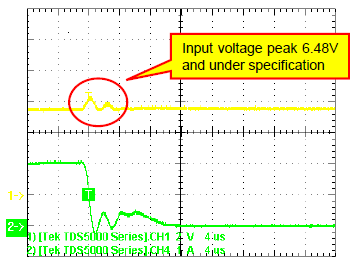 There are three recommendations to reduce the input spike voltage shown as below. 4-1. Shorten the wire length between input power source and power switch input pin. 4-2. Reduce the operating input voltage level. 4-3. Increase the capacitance of input capacitor. In the Example 3-1, if the input voltage changed from 6.5V to 5.5V and the input wire length is changed from 35cm to 10cm, the spike voltage level will be reduced greatly. 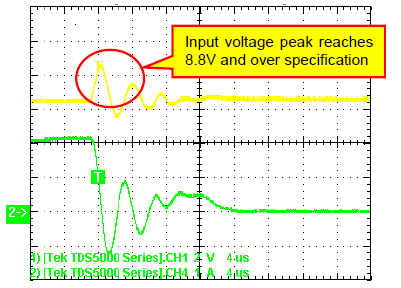 Figure 3 shows the test result that the spike voltage (6.48V) is under the absolute maximum rating (6.5V). In most of applications, the input voltage is 3.3V or 5V system. The power switch should be placed close to the input power source to shorten the input wire length. To place a larger input capacitor (ex: 33uF or larger) at the input pin is also a good solution. In order to obtain better performance, careful PCB layout is necessary. The following guidelines must be considered. l Locate the input capacitors as close as possible to the chip VIN pin and GND pin. l Place a ground plane under circuitry to lower both resistance and inductance. l Keep all power traces as short and wide as possible. l Locate the output capacitor as close to the connectors as possible to lower impedance between the output port and the capacitor and improve transient load performance. The input voltage spike could be controlled by the solutions in section 4. It is necessary to take care on the operation conditions which include operating input voltage level, input wire length between power source and input pin, input capacitor, and PCB layout.